Arram Draper is on the path to becoming one of the realm's most powerful mages. The youngest student in his class at the Imperial University of Carthak, he has a Gift with unlimited potential for greatness--and for attracting trouble. At his side are his two best friends: Varice, a clever girl with an often-overlooked talent, and Ozorne, the "leftover prince" with secret ambitions. Together, these three friends forge a bond that will one day shape kingdoms. And as Ozorne gets closer to the throne and Varice gets closer to Arram's heart, Arram realizes that one day*--soon*--he will have to decide where his loyalties truly lie. Never disappointed with Tamora Pierce. Numair’s book was another one I could not put down, I cannot wait for more! I have been a fan of Tamora Peirce for 27 years. She has written anothet fantastic book. I was swept along with the story, my heart racing with the rising and falling tides withing the story. I was sorely disappointed when I finidhef the last page as i did not want yhe book to end. I look forward to the next installment. What more is there to say, than that it was amazing! Tamora Pierce takes readers back to some of her most beloved characters and lets us learn more about how they grew up. Also, the world building is just brilliant and I was swept away in a world with fantasy and magic. Loved it and highly recommend the book! 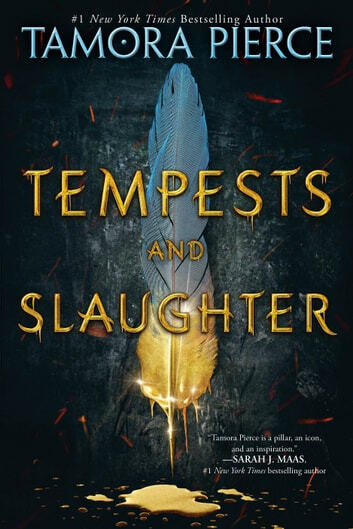 Originally posted on Tales to Tide You Over I don’t normally review two books by the same author so close together, but I’m making an exception for Tamora Pierce. (Binge reading makes the author’s style/technique stand out too much for me.) 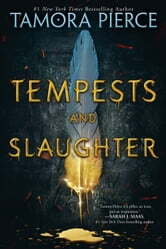 This is a before and after view because I read Alanna (an early if not her first novel) before meeting the author at BayCon, and Tempests and Slaughter is her most recent novel (I believe), which I read after meeting her. Stylistically, I saw many of the same choices between the two books. Both looked at social inequity, layers of society dependent on each other for all the top would prefer to forget it, and corruption at the top leading to treating others as toys rather than people. Still, the two books were not mirror images in any sense of the concept. They explore these elements through different eyes and in different ways. Arram Draper, the main character, is a young boy advanced in both his capacity to learn and eagerness to do so. His innate magics are far beyond most, but his control is such he’s sent to university much too young because he became a danger to himself and his family. He’s not wealthy, too young to make friends, and has a problem with boredom that his erratic powers exploit. The first thing that impressed me about the university was its approach toward gifted students. Arram’s talents cause serious trouble. While he’s made aware of his lack of discipline and schooled in it, the headmaster takes it upon himself to ensure Arram is never bored but rather challenged to the full extent of his abilities (at least as far as the masters can tell). Some of his instructors are happy to make time for him. Others want to prove he’s not as good as believed. This is not an idyllic picture that ignores the realities, but rather a system set to benefit each student to their best ability, be it above or below the average as we later learn. Even better, this decision puts Arram with two other gifted students, Ozorne and Varice, who become his best friends with little care to their differences in station or upbringing. While Varice acts more as a helpmate than having her own driving force at least in this book, she does speak out against the dismissal of kitchen magic with, often vicious, examples. Ozorne is a little more complicated as he’s in line (though not close) to become emperor. He holds a grudge against all Sirajit people because of how his father died and can attack anyone with that nationality at the slightest provocation. There’s a darkness in him, and at times, it seems Arram and Varice are all that prevent him from becoming a monster. That’s another theme explored in the book. Not just the dismissal of kitchen magic by mages practicing accepted methods, but also in looking at tribal or sub-culture magics. Though taught, these magics are considered less valuable by the main culture when the ancients understood their power all too well. Then there’s the gladiator Arram meets in the beginning and who offers a tangible example of why slavery (all the gladiators are bought and sold to die for entertainment) is evil. He also combats the sense of slaves as somehow less than human, beings who want this life and care for nothing but claiming their next victims. Instead, Musenda has earned the respect of the other gladiators, the healers, and Arram for how he treats the others, and for taking care of his sister and her children. This review has gotten long enough, and it’s hard to mention anything without adding something that could be a spoiler. I’ll stop here with this last glimpse into how Arram won me over. He’s smart and yet still a kid feeling his way through responsibility versus ability. Arram is thoughtful, aware, and curious about the world around him. He’s not the type to accept what is as what has to be, nor is he arrogant when so many in his situation would be. I felt as though I got to know the characters, and not in a superficial fashion either. Some I trust, some I do not, but there’s no question The Numair Chronicles will be layered in complexity and full of those tough decisions that tip the balance between a good person and a bad one. By not reading the other books already, I come to this series with a blank slate and eager to discover what happens next. A great magical fun read ! Finally , another Tamara Pierce book , well worth the wait. Young people being heroes and best friends as they learn about magic, and their world.